By mid-November 1845, Stephenson was back at home — at Tapton House in Chesterfield — and appeared to be making a good recovery from the chest infection that marked the end of his trip to Spain. Recounting his adventures to Michael Longridge (1785-1858) he wrote of traversing "mountain passes where a carriage had never been before — we passed just under the snow range". Accompanied by colleague Joshua Walmsley (1794-1871, knighted 1840), he had covered 4,800km in 33 days. 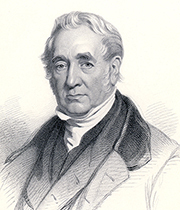 On 11th February 1846, he and William Howe (1814-79) were granted a new patent (No. 11086) for the design of a three-cylinder steam locomotive. While working at Robert Stephenson & Co in 1842, Howe had perfected the valve gear popularly known as the Stephenson Link, invented by fellow employee William Williams. In November 1846, Stephenson appointed Howe as engineer to the Clay Cross Colliery. The new patented locomotive featured three cylinders — a central 419mm diameter cylinder, 457mm long, and two outer cylinders, 267mm in diameter and 559mm long. The engine was carried on six wheels: a pair of 2m diameter driving wheels and four smaller ones. It proved more stable at high speeds than conventional two-cylinder locomotives. Two engines were constructed, and one worked the York, Newcastle & Berwick Railway. On 7th May 1847, one of them drew a train from Wolverton to Birmingham on the London & Birmingham Railway, covering 66km of the journey in 42 minutes and reaching a maximum speed of 103kph (64mph). During the autumn of 1845, the British economy began to weaken. Poor harvests threatened famine. Railway shares dropped in value, stabilising in 1846, and rising again later that year. Dividends improved, peaking in July 1847. However, the mania for railways was beginning to falter and share prices fell sharply once again, followed later by waning financial returns for investors. Despite this, the enthusiasm of railway engineers seemed undiminished. A groundswell of opinion favoured a new institution for mechanical engineers separate from the Institution of Civil Engineers (founded 1818). James Edward McConnell (1815-83) led meetings to formulate and approve rules for a new organisation, and on 27th January 1847, the Institution of Mechanical Engineers (IMechE) was established at the Queen's Hotel in Birmingham. Stephenson was voted its inaugural President, with McConnell as Chairman. The Institution would move its headquarters to London in 1877. Institution matters kept him occupied in 1847, which also brought news of the death of his elder brother James 'Jemmy' Stephenson, at Snibston (Coalville) in Leicestershire on the 9th August, aged 68. Only his youngest sibling, Ann (1792-1860), who had long since emigrated to America, would outlive George. Stephenson wrote papers for presentation at Institution meetings and took part in the discussions that followed. On 16th October 1847, he hosted an Institution council meeting at Tapton House. Over the years, he had compiled a scrapbook of newspaper cuttings on all manner of subjects. As William Oswald Skeat (1904-93) wrote, "The universality of his interests was astonishing. He must have been one of the most stimulating of companions. It would be a great mistake to imagine that he could think of nothing but coal mines and railways ...". Always keen to encourage younger engineers, he was also a popular speaker at various mechanics' institutes where he would recount with relish his early hardships and subsequent triumphs. His last such engagement would be at the Leeds Mechanics Institute in December 1847. With his son Robert Stephenson (1803-59) fully occupied on his own engineering projects, George spent time birdwatching, poultry keeping and gardening. He devised a method akin to modern battery farming for the fattening of chickens at twice the natural rate, and commissioned the making of glass tubes to enable the cultivation of straight cucumbers. He also delighted in growing pineapples, melons and grapes in his greenhouses, apparently in rivalry with Chatsworth House's gardener, Joseph Paxton (1803-65), designer of the future Crystal Palace (1851). Stephenson grew fond of his housekeeper, Ellen Gregory (1808-65) a farmer's daughter from near Bakewell in Derbyshire. They married at St John's Church in Shrewsbury, Shropshire, on 11th January 1848. The wedding was apparently not welcomed by all. According to biographer David Ross, "The news of his intention had been received by Robert as an unpleasant shock", while his friend Thomas Summerside remarked "I don't remember to have seen her". On 26th July 1848, Stephenson attended an IMechE meeting at which he read his paper On the Fallacies of the Rotary Engine [steam rotary engines]. It was to be his final appearance before the members. Shortly afterwards, ill health returned in the form of another attack of pleurisy (inflammation of the lining of the lungs and chest cavity), this time serious. He died at noon on 12th August, aged 67 years. The funeral was held five days later, on 17th August 1848, at Holy Trinity Church in Chesterfield, accompanied by a great number of mourners. The pall bearers included Summerside and Edward Pease (1767-1858), then 81 years old. Stephenson was buried with full Masonic honours in a vault under the chancel, in front of the altar table, at the east end of the church. The place is marked by a simple inscription in the stone slab: G.S. 1848. His name was added to the tablet commemorating his second wife Elizabeth on the south wall of the chancel. Robert later paid for a large memorial window in the east wall of the church. His widow Ellen was well provided for, inheriting a lump sum of £1000 and household goods, plus an annual income of £800 if she remained single. However, for some reason she found this unsatisfactory and applied to Robert for an increase in her allowance. He referred the matter to his solicitor. Ellen did not marry again. Stephenson's death was much regretted and there were plentiful tributes in the press and from his contemporaries. The obituary in the Athenaeum of 19th August 1848 described him as a "mechanical genius" and the "author of the railway system, the first great practical improver of the locomotive steam-engine ...". Reviewing Stephenson's life, the Derby and Chesterfield Reporter declared, "He was too truly great to be ashamed of the beginning out of which he sprung ... Take him, for all in all, we shall not look upon his like again. Nay, we cannot, for in his sphere of invention and discovery, there cannot again be a beginning". By April 1850, the rail-building mania was over.